Husker Cody Willnerd always wanted to visit Africa. The diverse ecology and wildlife of the vast continent sparked his imagination as a child when he watched Animal Planet. Little did he know then that one day he’d be in one of the most remote parts of Kenya, conducting interviews with and learning about the Dassanech tribe, a pastoralist population practicing a traditional lifestyle that dates back more than 5,000 years in East Africa. But that’s exactly how Willnerd, a senior environmental studies major, spent his summer, and it may have changed his future trajectory as well, just like those old wildlife shows. 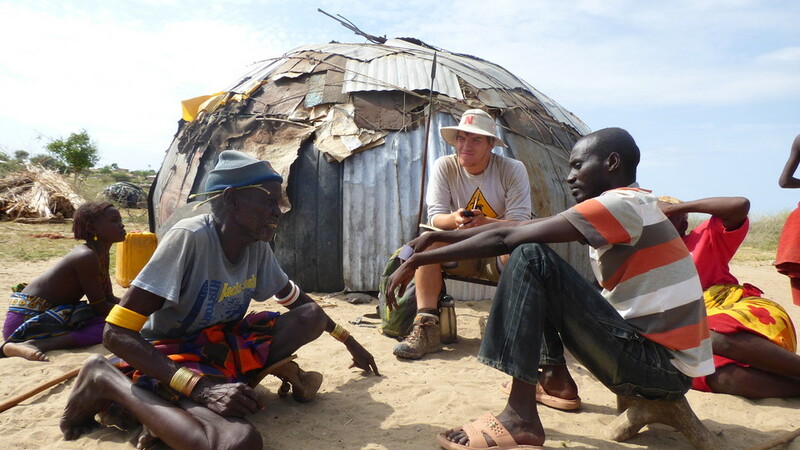 Through a University of Nebraska-Lincoln UCARE grant, Cabela’s scholarship and study abroad assistance from the College of Agricultural Sciences and Natural Resources (CASNR), Willnerd spent six weeks in Kenya, near Sibiloi National Park, as a student researcher with the Koobi Fora Field School. After two weeks of classes, which covered the ecology, natural resources and history of the area, Willnerd set out with his adviser, Matthew Douglass, assistant professor of practice in CASNR, to conduct interviews and gather data. The project was suggested by field school faculty, of which Douglass is a member, because little research on the Dassanech in northern Kenya has been done. The initial goal, Willnerd said, was to get an idea of what was causing the tribe to take their livestock into the national park, where grazing is illegal. This practice has caused conflict between the tribe and the Kenya Wildlife Service. Working with an interpreter, Willnerd was in the field collecting data four to eight hours a day. He spoke with 37 different people, including the chief of one of the eight Dassanech clans, to gather 22.5 hours of audio interviews. In addition to interviews, Willnerd took observations of land cover, other natural resources and shelters – called bomas – used by the Dassanech, and will be reviewing 40 years of aerial imagery to map how the grazing and settlement patterns have changed. Initial findings showed that the presence of new water wells, assistance from food agencies, drought, population increases and other issues have impacted the Dassanech in both positive and negative ways. “They’re rapidly changing their culture and how they’re interacting with their environment because they’re becoming more connected to this global world,” Willnerd said. This was Willnerd’s second time studying in Africa, having been to Botswana in 2017, but it was the first time he was able to interact with the people so much. Douglass said Willnerd showed resilience and adaptability, which was paramount for doing this type of research. “It’s a wild situation to go into, but Cody excelled,” Douglass said. To Willnerd, it was an adventure, and it opened his eyes to new opportunities. While he said he his interests in natural resource management haven’t changed, the research and experiences in Kenya have made graduate school an option to further his career. For now, Willnerd is concentrating on turning the interviews, observations and GIS data into a senior thesis research project so he can graduate in May 2019, but he said he hopes another trip to Africa is on the horizon. This article is reposted with permission from Nebraska Today and the article's author; the original may be found on Nebraska Today: https://news.unl.edu/newsrooms/today/article/husker-spends-summer-with-5000-year-old-tribe-in-africa/.